A 6-year-old girl in Africa loses her parents and has no one to care for her. Where will she get her meals? She does whatever it takes to survive. Some days she will ask strangers on the street for food. Other days she will find scraps — even in the garbage. And some days, she will have nothing to eat at all. Many children live like this every day. Your gift TODAY will ensure these children and families living without enough food receive regular shipments of meals from Global Aid Network® (GAiN®). It costs just 13 cents to provide one meal AND share the hope of Jesus. That means every $20 you send will provide 154 meals. So many people living in Africa, Central Asia, and Latin America need help getting the food they need to survive. Many of these people might not survive unless they receive life-saving food. Your help is especially critical right now. 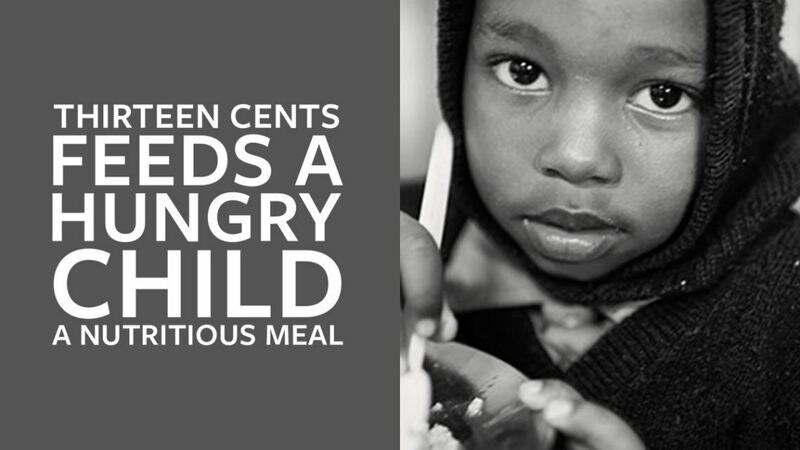 Just 13 cents a meal gives nourishment and relieves suffering, restores dignity, and reveals hope!